Halloween. Isn’t it pretty much the same the world over? Here in the Florida Keys we’ve discovered the answer is no. In the Keys the hot climate results in many differences from what we are used to in Ottawa, Canada. My framework for Halloween includes warm clothing, children and gleeful observation. Some people go to work dressed like cleavage-bursting pirates – school teachers being the exception. Librarians and school administrators tend to wear pumpkin-themed earrings and sweaters. I can’t speak to the downtown dance club culture. But because we are a government town – with the Parliament buildings forming a social centerpiece – we do value our sleep. I would guess that taxis are more difficult to get on the weekend prior to Halloween, should the event occur on a weekday. Halloween, for our family, is usually a 1-hour cold-weather dash. Here is a picture that I took last year of Karen at Halloween. 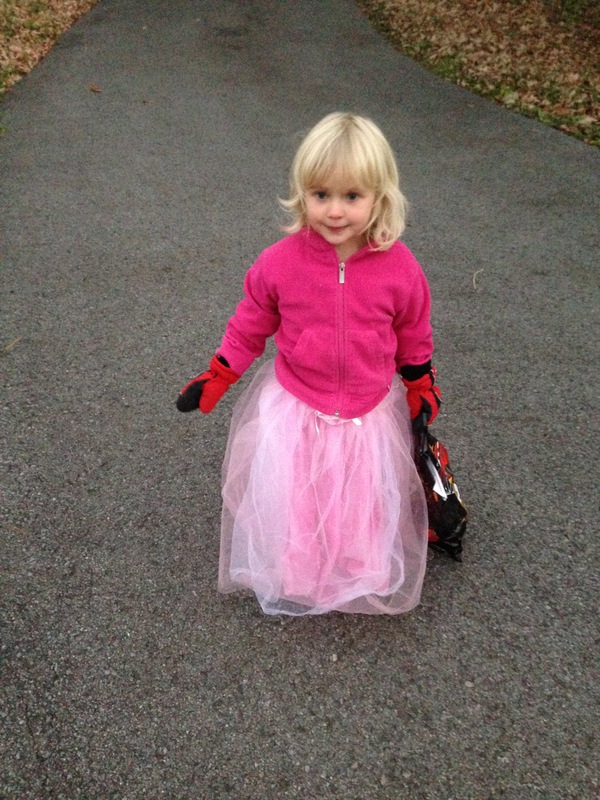 Karen (age 3), Halloween in Ottawa 2014. In 2012, we had a light dusting of snow on the ground during Halloween. It was also the year that Henry lost a shoe, cutting our evening even shorter than usual. 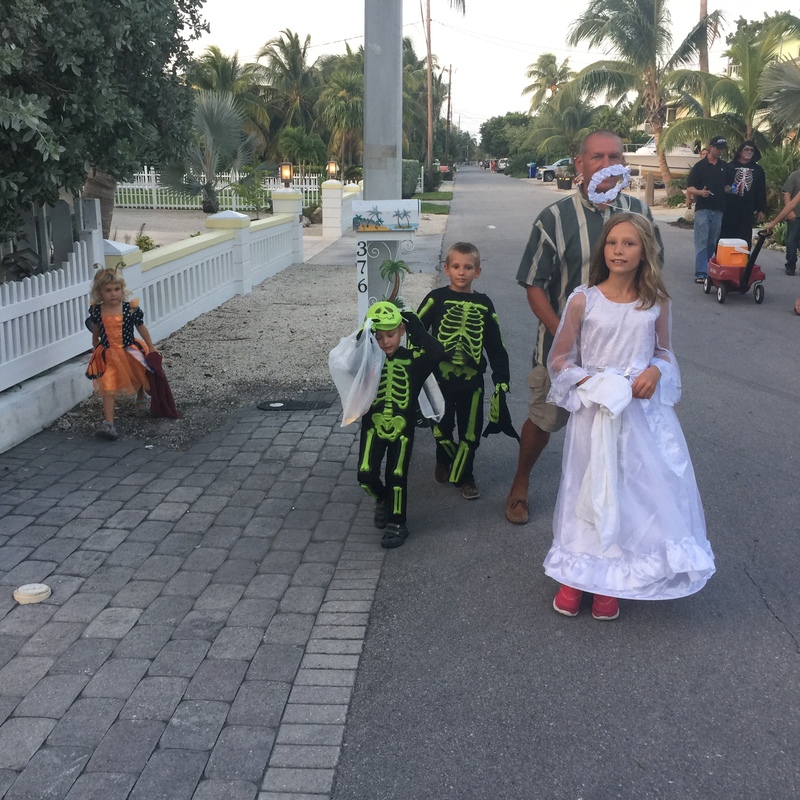 Here, in the Florida Keys, we had two clues that Halloween was going to be different. First, there was an almost complete absence of fuzzy, warm costumes. And, second, our friend Dave told us that one of his neighbours spends $400 every year on Halloween candy. If we had been on land then we would have noticed that golf carts were being delivered in the neighborhood – and not just a few – to households that wanted an extra boost to get them to where they needed to be on Halloween night. Here is a picture of our kids as they set out on the streets in Tavernier, Florida. Our kids with my husband, Rick. Tavernier, Florida 2015. 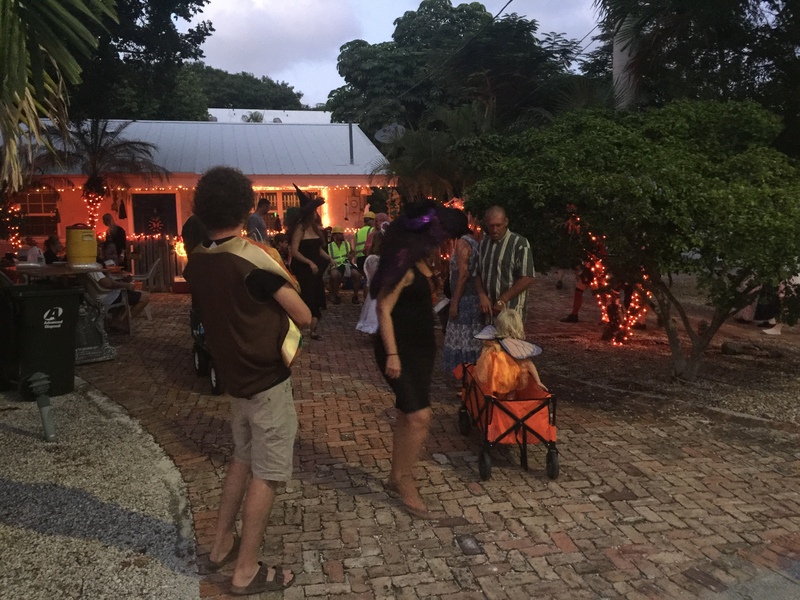 Halloween in Tavernier is a carnival. People do not turn a light on, watch television and wonder when the doorbell will ring. Instead, homeowners sit in the street or on their driveways to give out candy. A house in Tavernier. One of many that are fully decorated and offer haunted house tours. Children and adults alike dressed in costume. One man was dressed as Colonel Saunders, and carried a KFC bucket. I believe he was collecting candy. One house gave out water, beer and soft drinks. They had Ghostbusters playing on a television that they had rigged outside their house. At another house, a television showed a sports game – football perhaps. Their house was steps away from the waterways and canals that allow people to access the water, right from their doorsteps. As the night wore on, more crowds came. The Sheriff drove by with a helper giving pumpkins from his truck. Firemen gave out glow-in-the-dark necklaces. Chocolates began to melt. We returned back to our catamaran, SV Aphrodite. The kids inspected their haul. It was fun and, of course, yummy – making it a universal Halloween experience. 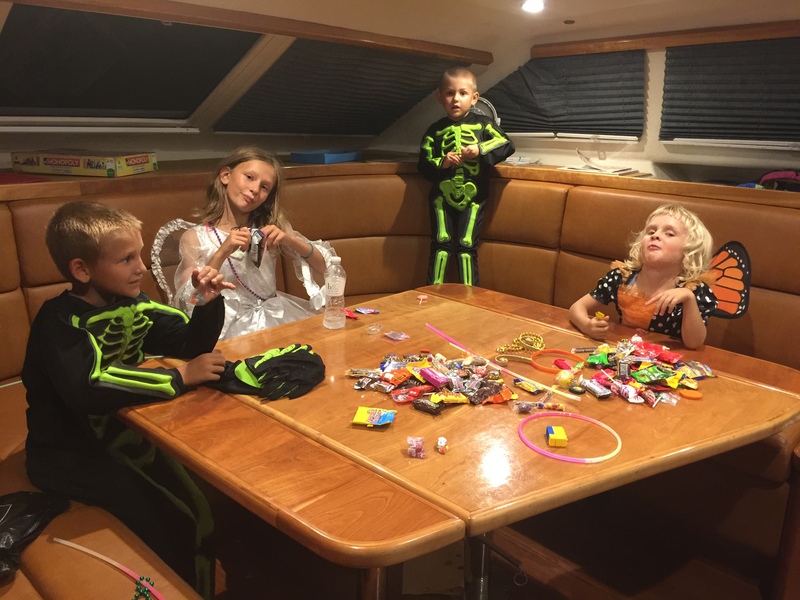 Halloween candy inspection on SV Aphrodite. What an awesome experience! I’m slowly catching up on old blog posts and really enjoying it.